Are you a fan of the Kindle and similar e-book readers or do you like to turn real pages and enjoy the smell of a new book? According to a Telegraph article, Mills and Boon readers are leading the way as buyers of e-books, possibly to avoid the ’embarrassment factor’ of being seen reading them in public (personally I think there’s nothing wrong with reading M&B but I suppose if you’re a big butch male then you might not want to own up to your secret pleasure!). One of the best-selling romantic downloads on Amazon is the M&B The Temp and the Tycoon by Liz Fielding. Sales of e-book readers amongst romance fans have been so great that Sony has designed a pink version of its reader complete with M&B logo (not one to buy if you prefer to hide your reading preferences!). Whatever our current feelings about e-readers versus ‘real’ books I think we will see increasing numbers of people using them on buses trains etc. 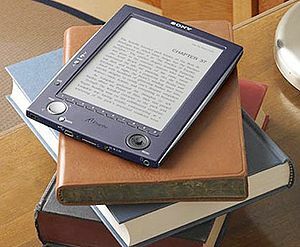 I started off very anti e-readers but am now beginning to find the thought of having all my books in one little device instead of piled around the house rather attractive. This does mean that, as authors, we can no longer look forward to that thrill of spotting someone reading a book in public that we have written. But on the upside, e-books make self-publishing a lot easier. Have a look at Carol Bevitt’s blog for some useful information from freelance writer Deborah Durbin about Kindle Direct publishing. So, on balance I think we should welcome this new technology. For many of us there will be a long cross-over period when we read both physical books (I, for one, a have a huge backlog to get through) and at the same time get to grips with the new technologies of e-readers (great for holidays and travelling). This entry was posted on April 7, 2011, 11:00 am and is filed under Books. You can follow any responses to this entry through RSS 2.0. You can leave a response, or trackback from your own site. I agree with you, although it’s somewhat daunting, the possibilities for getting your work out their and people buying and reading what you do are very exciting. Karen – Exciting & challenging. Doing the writing will just be the beginning – there will be the technicalities of e-publishing to master plus a massive web marketing excercise! I wouldn’t mind my work being published as an ebook, but when I’m reading, it has to be the real thing. Patsy – other way round for me, I think. I’d love the kick of seeing my book in print but am beginning to see the benefits of the Kindle for readers. Well, I decided to put my book on Kindle. I think more and more authors will take this route. My daughter loves her Kindle, as she travels a lot and can’t fit books into her handbag. The Kindle fits perfectly. Good Luck with the book, Shirley. I just followed your link through to Amazon and see you have 2 fantastic reviews up there already and I can see your daughter’s point about fitting the Kindle in her handbag!